French Fries Smothered In Cheese & Gravy Sounds Delicious… As A Soda Flavor? There are few food combinations more widely beloved than French fries, covered in melted cheese and then topped with a generous helping of gravy. 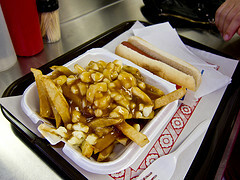 Some call them simply fries ‘n’ gravy, some call them disco fries, but in Canada the dish is revered as poutine, incorporating cheese curds and brown gravy. Playing off that nation’s love, Jones Soda is releasing a Poutine flavored soda. Yes, a liquid that tastes of potatoes, cheese and gravy. It’s real — and why not? Jones has had other savory flavors, the company notes in its announcement of the limited release item. We get it, comfort food sells (and side note, I’m now drooling). But as a drink? Liquidy cheese? We leave this all-important question to you.